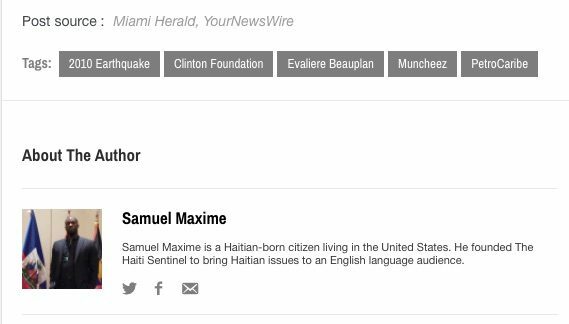 FACT CHECK: Did a Former Haitian Official Commit Suicide Before Clinton Testimony? 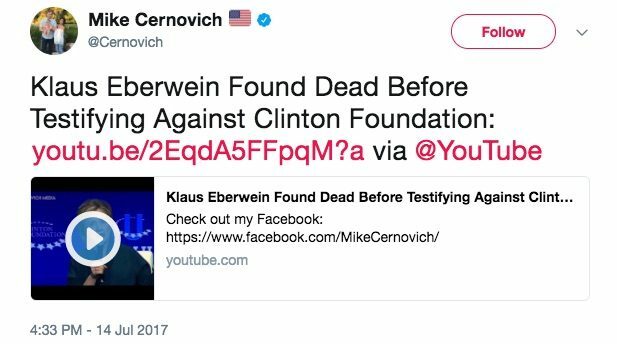 After Klaus Eberwein's suicide, inevitable links to the "Clinton Body Count" rumor emerged, but without clear merit. Former Haitian official Klaus Oberwein died in a suspicious suicide days before he was scheduled to testify against either Hillary Clinton or the Clinton Foundation. On 12 July 2017, the Miami Herald covered the death of former Haitian official Klaus Eberwein, news that soon developed into an version of the “Clinton Body Count” political urban legend. “He shot himself in the head,” said Veronica Lamar, Miami-Dade medical examiner records supervisor. She listed his time of death at 12:19 p.m. … The address where Eberwein’s body was discovered according to police, 14501 S. Dixie Hwy., is a Quality Inn. … it appears that Eberwein had fallen on hard times. An Uber spokesperson confirmed that he worked as a driver for awhile in South Florida. The outlet originally reported that Eberwein was slated to appear in relation to a probe into the management of PetroCaribe funds, “the money Haiti receives from Venezuela’s discounted oil program”. 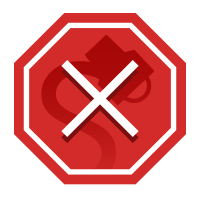 We were unable to find a credible link to Eberwein’s involvement in the hearing; the same unsourced claim was repeated by a blog called the Haiti Sentinel. Related rumors of the Clintons’ relationship to Haiti appeared in October 2016, this time alleging that after the Haiti’s infrastructure was devastated by a major earthquake in 2010, the State Department steered relief contracts to personal friends of the Clintons. However, while Hillary Clinton did recommend specific companies to help with the rebuilding process and e-mails have surfaced indicating that special attention was given to “FoBs” (“Friends of Bill”), there’s no evidence that the United States government awarded contracts to any of those contenders. … one person even closer to the secretary of state was singing a different tune—very, very quietly… after a four-day visit to the quake zone, Chelsea Clinton authored a seven-page memo which she addressed to “Dad, Mom,” and copied their chief aides. That informal report tells a continuing story of the unique brands of power and intelligence wielded by the Clinton family in Haiti and around the world—and of the uniquely Clinton ways they often undermine themselves. Chelsea Clinton was blunt in her report, confident the recipients would respect her request in the memo’s introduction to remain an “invisible soldier.” She had first come to the quake zone six days after the disaster with her father and then-fiancé, Mark Mezvinsky. Now she was returning with the medical aid group Partners in Health, whose co-founder, Dr. Paul Farmer, was her father’s deputy in his Office of the UN Special Envoy for Haiti. What she saw profoundly disturbed her. Here is an island country of 10 million people where America’s ultimate power couple invested considerable time and reputation. Here is a fragile state where each took turns implementing destructive policies whose highlights include overthrowing a presidential election. Bill Clinton in particular mixed personal relationships, business, and unaccountable power in ways that, if never exactly criminal, arouse the kind of suspicion that erodes public trust. No two individuals, including Haiti’s own leaders, enjoyed more power and influence than the Clintons in the morass of the failed reconstruction following the deadly Jan. 12, 2010, earthquake, when a troubled country managed to go from catastrophe to worse. The claim about Eberwein’s purportedly suspicious suicide bore a strong resemblance to similar rumors involving former U.N. official John Ashe in 2016. Ashe purportedly died before he could testify against Clinton in the summer of that year. Although insiders have repeatedly stated that Ashe was never scheduled to testify against Clinton, his name regularly appears on lists of those allegedly murdered by the Clintons or their associates. We attempted to contact both the original Herald writer as well as Sen. Evalière Beauplan to verify the link or lack thereof, but have not yet received a response from either. Miami Herald. 12 July 2017. Miami Herald. 22 November 2014. Haiti Sentinel. 15 July 2017.